This game is a gem! It’s F2P(Free to Play) with some micro transactions. 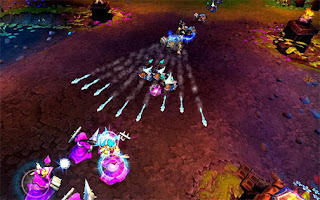 The game is a moba style game which I will explain later. LoL is focused on PVP. You can play 3vs3, 5vs5 or a custom match which you create yourself. The purpose of the game is to destroy the base of the other team. You can choose between many champions to play the game. Each champion has his or her own specifications that are all useful in battle. When the game starts your champion is lvl1 and the goal is to level him up to 18. The beautiful thing about this game is that you can buy items to customize your champion. For example: Some items make you more powerful, some make you faster, etc… These items only last for one match. All champions have 4 skills which can be upgraded by leveling up. The game itself is pretty easy to pick up and there are some nice tutorials out there that help you a lot. The graphics are cartoony which I like very much because it makes the game more unique. The gameplay is very smooth and very fun. The LoL community is very big and most people are friendly and supportive but sometimes there are people who leave in the middle of a match and that is very frustrating. (Once I played a 5vs5 and there were 3 people AFK!!). In short: This game is a must have for every pc gamer that wants to play a quality game for free. Players who pay for micro transactions have no advantage over the free players so everyone is equal. One negative thing is that you can’t buy skins (these can be used to dress your champion) with in-game money.